For me, one of the most appealing things about New York is its vast diversity. It is a city in which you are surrounded by various cultures, neighborhoods and boroughs, each containing and contributing its own unique flavor. New York City is like a big pot of wedding soup with lots of delicious ingredients married together, making up the special recipe of what makes it so great. 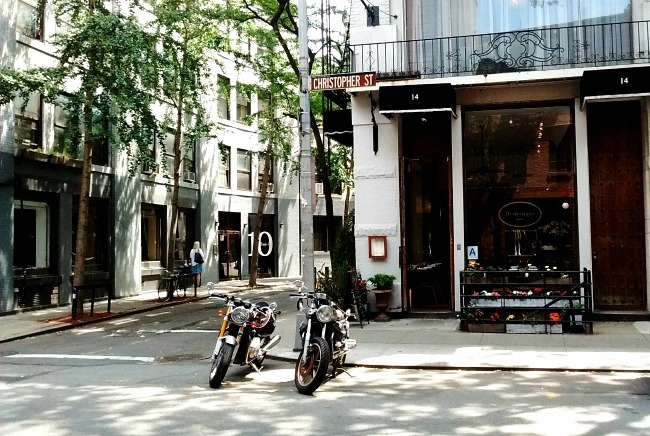 And although New York is often referred to as a "massive concrete jungle", there are many areas of green and quiet. Today, I would like to share some of the diversity within my favorite city. This final photograph made me smile and laugh out loud when I spotted it in a souvenir store. I love you, New York! Have a smashingly fabulous week, y'all! What amazed me about NY was how tidy it was. Even round the street vendors there was no litter. In our big cities some people throw their litter on the pavements. I don't go into the city now but I'm told the litterbugs have multiplied. Naked cowboy? I hadn't heard of that, but I do remember a naked man running through Time Square. Actually, I only remember the incident, not the man. I had popped into a shop, leaving Joe to wait outside and it was he who saw the guy. Would you believe Joe didn't call me out to take a look! Your post captures so many of the iconic images of NYC: pigeons, food vendors, Lady Liberty, and - of course - the Naked Cowboy. Can't believe he's still around! Grabbing lunch at Carnegie Deli is on my bucket list! 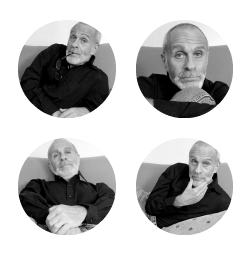 WONDERFUL photos, Ron! 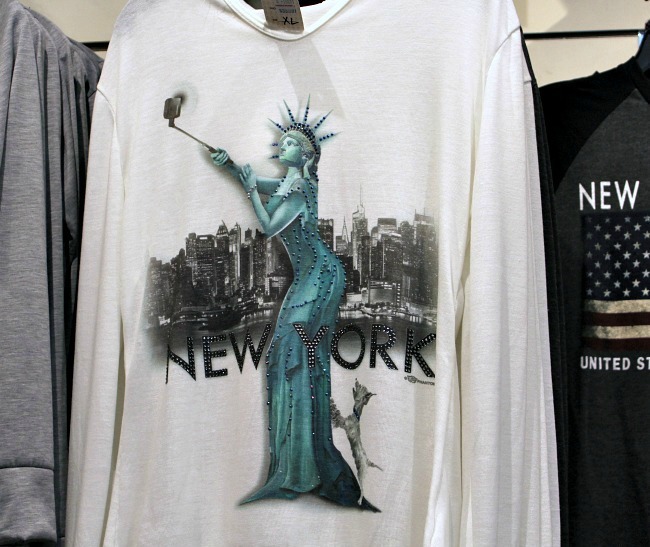 You really know how to capture the "feel" of New York! 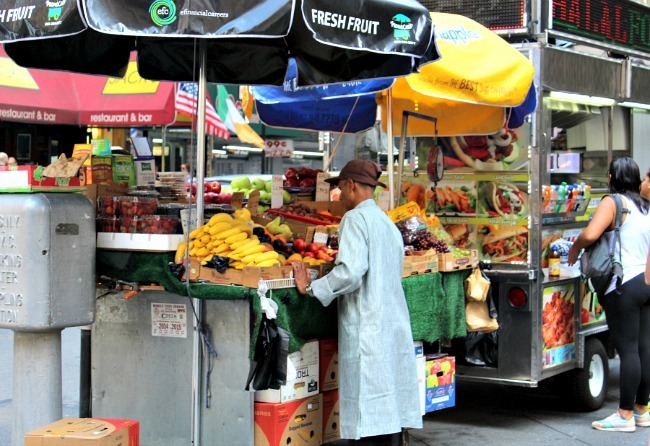 I love the roof top picture of Greenwich Village and the ones of the street vendors. That t-shirt is flawless. I want one Lol! Great shots, Ron. I remember thinking that NY was all concrete and then being astounded by Central Park. 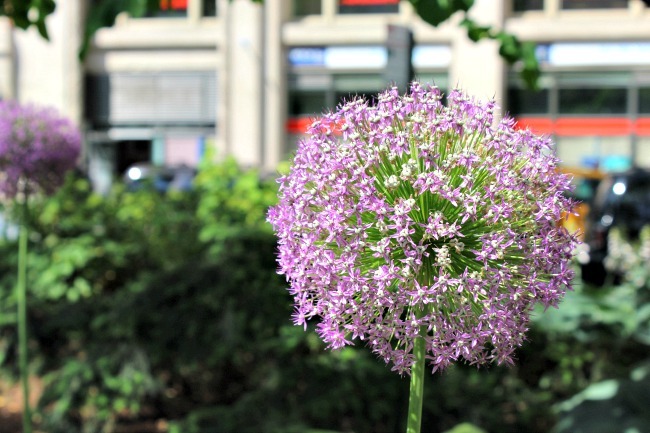 I like that photo of the single allium. 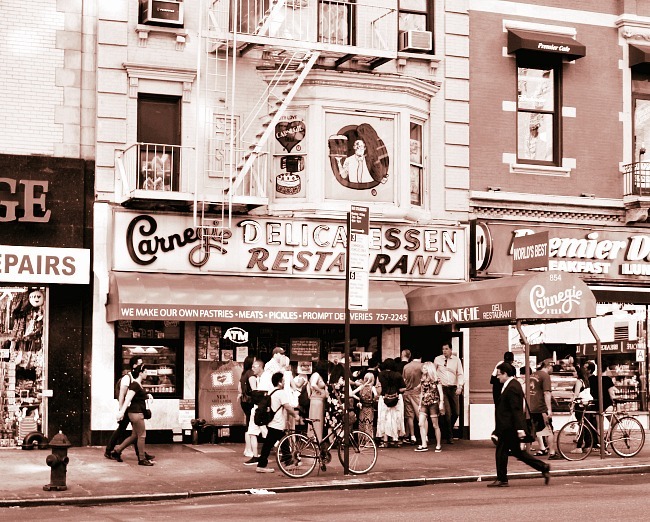 The picture of the Carnegie deli looks so timeless in sepia. And the colors are so vibrant in the rest, right down to the snacking pigeons. Love them all! Ron, every time you post about New York, it makes me want to go back there for a visit. AWESOME photographs, I love them ALL! I forgot about the notorious Naked Cowboy. Wow...he still looks good for his age. Great legs! The picture of the knock off handbags reminded me of when my girlfriend and I would go down to Chinatown in New York to shop for faux handbags and watches. Now they sell them everywhere in the city. Love the T-shirt! Thank you for sharing your love of my hometown, Ron! I've only been to New York once or twice, so I really appreciate your showing me what I never saw when I visited! I imagine this city is vast enough that it would take a l-o-n-g time to see all of it -- and I'm sure that's just fine with you, right, Ron?? I love the greenery, and that purple flowery thing. And how cool that the pigeons are taking advantage of lunch! They're real opportunists, aren't they, and I'm glad to see enough people are sharing with them. "New York City is like a big pot of wedding soup with lots of delicious ingredients married together, making up the special recipe of what makes it so great. Diversity." I really love how you said that Ron, because it's so true! And I think that's what I miss most about living there. It's funny how when you live there you take many of the great things about that city for granted. Your pictures are so GREAT!!! And they really do show the diversity of the city. 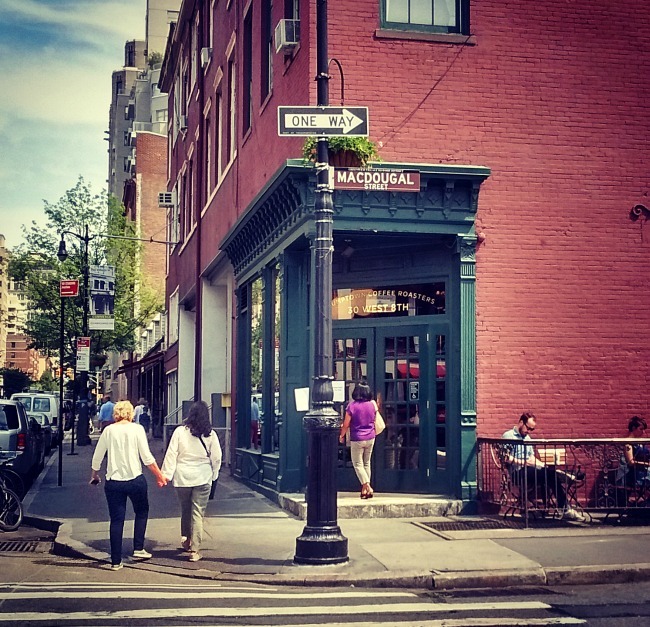 Love Greenwich Village. And that second to last picture of the busy street is gorgeous! You really have a great eye for capturing the best angles. Yes, I agree...NY is tidy; especially within the past 15-20 years. When I lived there (during the 70's-80's) it was very different. New York back then was much grittier. It had a very "bohemian" feel, and it wasn't as clean as it is now, but there was a certain charm and attraction about that. I laughed out loud when I read your comment about seeing the naked man running through Times Square! It's funny the things you see in a city like New York. "Would you believe Joe didn't call me out to take a look!" Thanks so much for stopping by, my friend. Hope you're having a lovely week so far! Thanks so much for stopping by, my friend. Have a grrrrreat week! "the Naked Cowboy. Can't believe he's still around!" I know, can you believe it?!? I also saw the Naked Cowgirl that day too, but didn't share the photographs on this post because they were a little "too" revealing. "Grabbing lunch at Carnegie Deli is on my bucket list!" I ate there a looooooooong time ago, when I lived there. I love Jewish delicatessens. Thanks so much for stopping by, buddy. Have a grrrrrreat week! Thank you, Candice :) I love New York, so it's easy to get inspired and take pictures. There is are so many wonderful things to photograph! I usually take anywhere from 125 to 130 pictures on a day when I'm there. Isn't the T shirt faaaaaaaabulous? It think the next time I go back I may have to buy one!!
" I remember thinking that NY was all concrete and then being astounded by Central Park." Isn't Central Park astounding?!?! It's HUGE. My apartment was on the east side of the park when I lived there (65th and 5th Ave). I used to love walking through the park during the fall because of the colorful leaves on the trees. 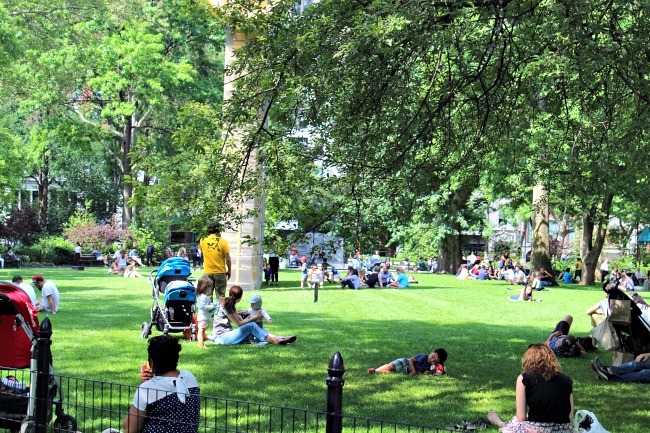 During the summer months, the park was packed with people sunning themselves on the grass. I ate at the Carnegie deli once. It's right across the street from Carnegie Hall. Thanks so much for stopping by. Have a fantastic week! "I forgot about the notorious Naked Cowboy. Wow...he still looks good for his age. Great legs!" I know, I thought the same thing. He's 45-years old, but looks much younger. Great legs indeed! "The picture of the knock off handbags reminded me of when my girlfriend and I would go down to Chinatown in New York to shop for faux handbags and watches. Now they sell them everywhere in the city." Yes, Chinatown back in the 70's was the place to go to get knock off handbags, watched and jewelry. When I first moved to New York, I lived at Pace University which was not far from the Chinatown area. My friends and I would always go there to eat Szechwan! Thanks so much for stopping by, neighbor. Stay cool this week because it's going to be a HOT one. OMG...I can't stand this heat.
" I imagine this city is vast enough that it would take a l-o-n-g time to see all of it -- and I'm sure that's just fine with you, right, Ron??" Yes, you are absolutely right. And even me, who lived there and visits often has not seen all there is to see because it's such a HUGE city.
" And how cool that the pigeons are taking advantage of lunch! They're real opportunists, aren't they, and I'm glad to see enough people are sharing with them." OMG...pigeons are everywhere in New York. In fact, I think they share about 50% of the population of the city - HA! Thanks so much for stopping by, my friend. Have a wonderful week too! "And I think that's what I miss most about living there. It's funny how when you live there you take many of the great things about that city for granted." True! When I lived there I took took much of the city for granted. I think if I were to live there again, I would regularly take days to play "tourist" so that I could see the city through fresh eyes - like a tourist. Even now when I go back to visit, I can't believe all the things I overlooked as someone who lived there. I used to attend a school in Greenwich Village. It was on Bank Street. I used to spend a lot of time in that area of New York. Hell Ron, your pictures of New York keep getting harder and harder for me to choose which ones I like best because they're ALL good! 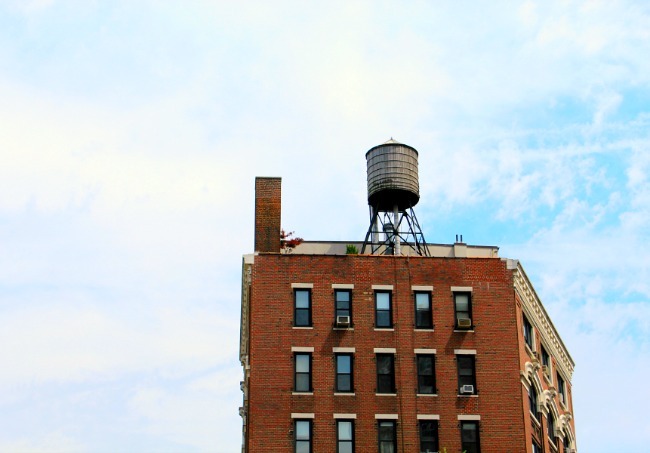 The one of Greenwich Village with the water tower on the roof is probably one of my favorites. Love the color of the Carnegie deli and MacDougal street photos. The one of the view down the street is so cool because I really get a sense of everyday life in the city. It's such a beautiful shot! That t-shirt rocks! Keep up the great work with your photos, dude! Fun shots, Ron! You know how much I loved the Paris Baguette photo. Last time I was there, I skipped the massive sandwiches at Carnegie and opted for a street vendor hot dog. So many iconic things to experience every time you go. 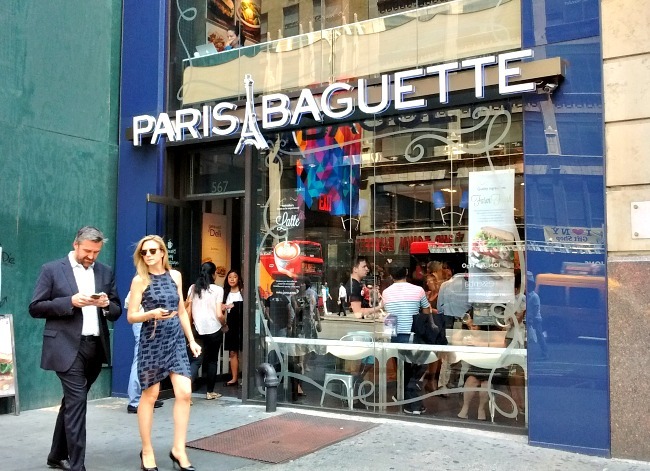 It's funny because I've never been to Paris, however, after I uploaded the photograph I took in front of Paris Baguette, it made me feel "as if" I had visited because the two people walking in front of the restaurant actually LOOKED like they were French - HA! True, the sandwiches at Carnegie are MASSIVE!
" So many iconic things to experience every time you go." I agree, which is why I keep going back to visit. Thanks so much for stopping by, my friend. Have a great week! Aw...thank you :) It's easy to take good pictures of New York because it's just naturally a picture perfect city that begs to be photograph! 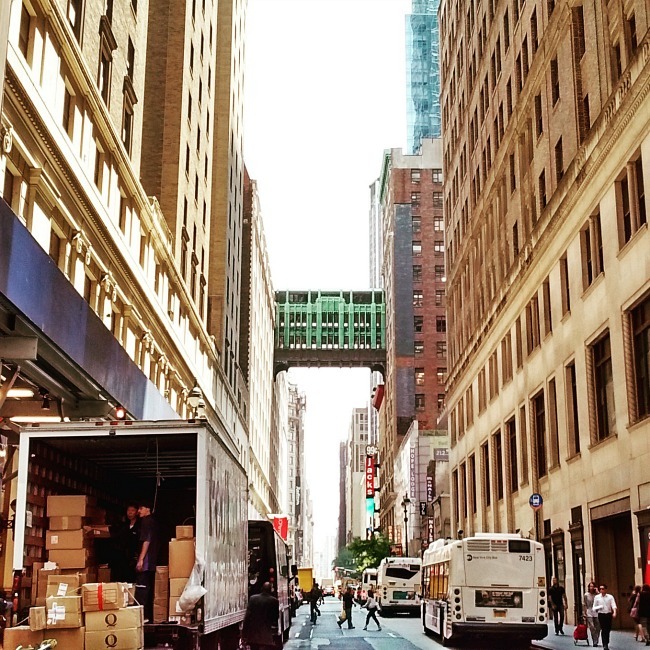 "The one of the view down the street is so cool because I really get a sense of everyday life in the city." It took that shot about 5 minutes after I arrived in New York that day. I got off the bus and started walking, when I saw that street and decided to take a picture. Ron, the heat was so intense yesterday and today that I couldn't even leave the house. I stayed inside all day and enjoyed the a/c. I'm ready for summer to be over! OMG...hasn't it been the WORST?!?! I can't stand the heat that usually comes in July. It's supposed to stay this hot until Saturday - OY VEY! Yes, I'm ready for summer to be over too! Wonderful shots. I love NY for its diversity too. Hope you're having a great week, my friend. Thanks so much for stopping by! Ron, I absolutely adore your New York photos...and your descriptions of every single thing about it! I haven't been feeling the best...so I haven't been blogging much. Hope all is well with you. Aw...thank you, Jeanne! :) I LOVE New York!!!!!!!!!! Hope you're feeling better soon. It's been so damn hot here lately, it's draining. Have a great rest of your week, my friend. Thanks for stopping by! "New York City is like a big pot of wedding soup with lots of delicious ingredients married together, making up the special recipe of what makes it so great." Such BEAUTIFUL words, Ron! That makes me really "FEEL" the pictures as I scroll down. And HOLD THE PHONE there is a naked cowboy!!!?? I wonder if his mom knows what he does? :) That is so funny!!!!! I think my favorite shot is the busy street one. The way the buildings on either side reach up like that. The shot is completely stunning. You have done some amazing photos of NY that show so many different things about it. You must turn each corner and see something new. Oh and the purple flower WOW!!!!!!
" And HOLD THE PHONE there is a naked cowboy!!!?? I wonder if his mom knows what he does? :) That is so funny!!!!!" HA! If you click on the link, you can read more about him. He's been a part of Times Square since 1998. And can you believe he's 45 year's old?!?! What a GREAT body, hu?
" You must turn each corner and see something new." Yes, and that's why I love NY so much. Its an amazing city with diversity at ever corner. Wow Ron, the picture of a view down a New York busy street is incredible! I love all these pics, but that one is really spectacular. 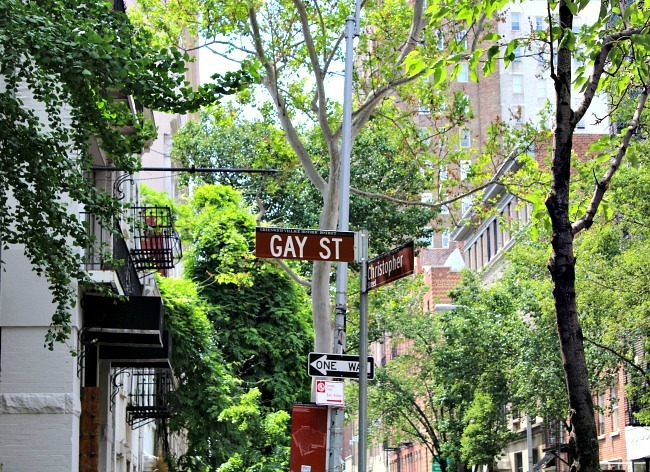 I also like Gay St. LOL! You have such a gift for capturing the essence of your favorite city. And I can see why! I really need to visit one day because I think I would really like it. Thanks, Robert :) If you ever get the opportunity to visit New York, I have a feeling your would REALLY, REALLY enjoy it. It's not a place that every could live, but it's definitely a place that everyone should visit at least once. The energy of the city is AMAZING! Thanks so much for stopping by, buddy. Have a fantastic week!!!! A fantastic group of photos Ron! I like them all, and REALLY like the one of Carnegie Deli. If not for the ATM sign in the window, it could have been taken many decades ago.
" If not for the ATM sign in the window, it could have been taken many decades ago." You're absolutely right, it could! Thanks so much for stopping by, buddy. Have a great week!